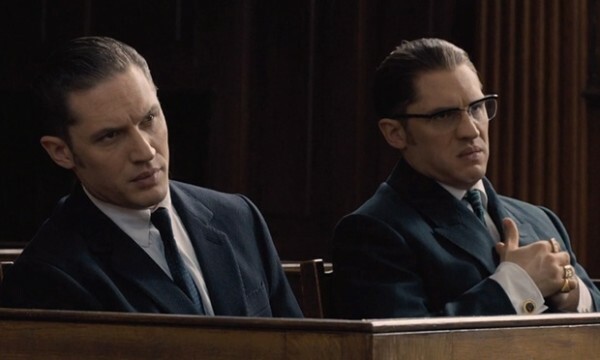 Legend for me is ALL about Tom Hardy’s performance. It is extraordinary and very clever so it is just a shame that it is lost in a very flawed movie. It’s even more gutting because I have been excited about this for a long time, but it sadly doesn’t add much to the gangster genre. The film primarily focuses on Reggie Kray, who promises his girlfriend-then-wife Frances (Emily Browning) that he will stop being a gangster and become a legitimate businessman. He has one problem: his twin brother Ronnie, who is psychotic and loves violence and the gangster life. 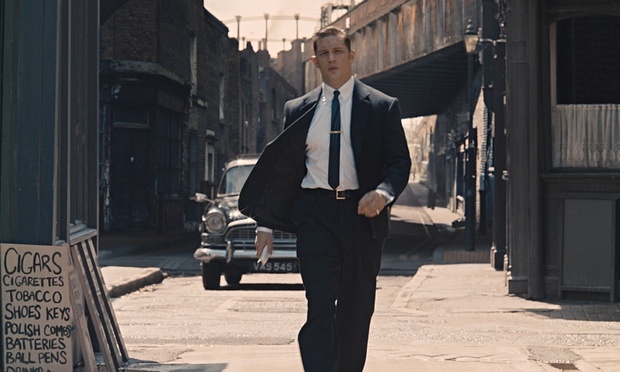 This charts the rise and fall of the brothers, and Frances, throughout 1960s London. Hardy is SO convincing as both brothers. You eventually forget you are watching the same person on the screen because their interactions seem so natural and realistic. He somehow manages to have chemistry with himself and they really do feel like brothers! I’m in awe and so impressed by how much work that must have taken to shoot the scenes they are in together – especially in the same shot at the same time. I also like the physical differences between the two – Reg looks like normal Hardy, but Ron has a very prominent jaw and lower teeth, a lower speaking range and a scowling demeanour. His portrayal of Ron did verge on the caricature at times – he didn’t seem as realistic as Reg and he made me laugh a lot and I’m not sure he was meant to! I don’t want to discount the support cast either. I thought Browning was superb and I couldn’t keep my eyes off her. She looks like a doll and her East End London accent was perfect. I knew how Frances’ story ends so I found it sad watching her become more depressed. I also have to give a shout out to Taron Egerton, who is my favourite, and he needed WAY more screen time. I liked the start and the end, but it heavily sagged in the middle because it was just bogged down with the standard gangster fare you see you in all those movies. I know they need to set up all the different facts/storylines but it felt too bloated and 131 minutes is too much. There were some key scenes like the fight between brothers, in fact all the fights stand out in mind, but the rest (besides Reg and Frances’ scenes) is already forgotten. It’s a shame Hardy’s dual performance couldn’t transform the whole film into something amazing. So I would tell you watch this for the performances because they are genuinely awesome, but the film itself is not that impressive when placed with other gangster films. We have seen most of the scenes before, which is why I’m glad they chose to see the Krays through Frances’ eyes. Her narration was wonderful, I also enjoyed the music, the sets and the clothes. This does have many redeeming qualities but I’m not going to remember most of it in a couple of hours.